Spring & Fall Golf Tournaments – Held in April and November at Crystal Falls Golf Course, this networking event is a fun day out of the office. Fee applies. Leander’s Best Party Ever – The Chamber’s annual awards banquet and fundraiser featuring live music, dinner, and a great party atmosphere. September 28, 2019. Fee applies. Lunch and Learn Monthly Membership Meetings – A monthly networking and business education session. Held the fourth Tuesday of each month at Hill Country Bible Church. Fee applies. Lunch with the Mayor – A quarterly intimate group of business members that meet to hear about economic development & progress of the city of Leander. Fee applies. Leander Women’s Network – A monthly networking and education opportunity for the business women of Leander. Held the third Thursday of each month. Fee applies. Old Town Street Festival – Held annually in the spring, the Old Town Street Festival is Leander’s food, wine, music, and art festival. May 18, 2019. 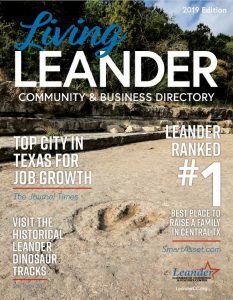 Leander Prospector’s Bus Tour – This annual event is held in October and hosts realtors, developers, and real estate industry professionals and features what’s new and in development throughout Leander. 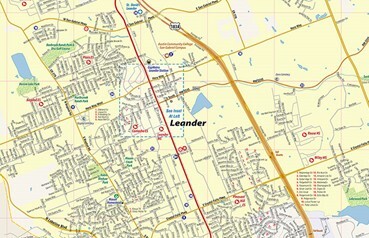 Living Leander Community Expo – A FREE, family-friendly event held each February. This event features performances from local youth groups, tons of door prizes, games, and over 100 local vendors. Liberty Fest – Our annual celebration of the 4th of July at Liberty Fest! This is fantastic FREE event perfect for the whole family. There will be live music, vendors, children’s activities, and fireworks. Movies in the Park – This series of outdoor movies shown on Friday nights in the fall and spring a great way to spend the evening with the family in your local Robin Bledsoe Park. Dive-In Movies – Come for a splash and a movie throughout the summer at Robin Bledsoe Park Pool (601 S. Bagdad). Open Swim begins at 8 PM and the movie begins around 9 PM. This is a FREE event. Bluegrass Festival – The Annual Leander Bluegrass Festival is a FREE event held in September that features live music, concessions, children’s activities, and a variety of vendors..
Christmas Parade and Tree Lighting – An annual event held the first Saturday in December includes pictures with Santa, hay rides, choral performances, a Christmas parade, and tree lighting. Spring Egg-Stravaganza – Leander Parks & Recreation hosts the annual Spring Egg-Stravaganza candy hunt. Bring your baskets and smiles for a hopping good time! Devine Lake Kite Festival – Leander Parks and Recreation hosts this festival each spring. This great FREE family-friendly event takes place from 11 AM-5 PM at Devine Lake Park. To participate in an event please visit the Event page. Once there, click on events within the calendar to view details, purchase tickets, or RSVP.